Have a repair need for your test equipment? Simply give us a call or e-mail a request at the link below with an explanation of the problem and we’ll take it from there. You will be notified of repair costs BEFORE the work is done. You can even get on-line access to repair status 24 hours a day. All parts, repair and calibration procedures meet or exceed original manufacturer’s specifications. 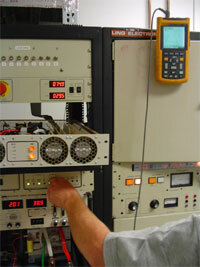 DTS services and repairs all makes of test equipment. Work can be performed onsite, or at our facility in Brea, CA. Our fully equipped test laboratory will insure tested items meet or exceed OEM specifications. We stock many hard-to-find parts and our experienced service staff will insure you’re up and running in no time. Have an Emergency requirement? Call our repair line, or Send us an Email, and we’ll contact you immediately. For urgent problems, call our 24 Hr Hotline at 714-273-5961.